Do you work for Harvest? Learning about Harvest? We can help. "It's a great, easy to use time-tracking solution!" I like that it is easy to use and integrate with other apps like Asana. It's handy that when you start tracking time on one project, it automatically stops tracking time on the other so you don't lose time between projects. (This may be more a complaint with Asana...) When I go back and forth from one project to another, it creates a new timer each time, rather than continuing where it left off. So I might end up with 4 or 5 10 minute chunks of time on a project, rather than just the total. It still adds up to the same time, it just doesn't look as clean. I trust Harvest to keep track of my time, and it reminds me when I forget to stop tracking time on something. It also makes it easy to edit your time should that be necessary, and looking back over past months is easy and convenient. Helps employees track their time - I work in Idaho, my boss lives in Romania, my co-worker lives in Wisconsin. "Harvest is a good application to control project times"
Harvest is a good application to control the times of the project, it is an easy, simple and very complete application. I love it because it is quite complete you can see everything you need about project times, send invoices of those times to the client, where those who have worked have been employees. Desktop, mobile and web integration is fantastic. My preference became the desktop toolbar - extremely user friendly. To be honest, this was the first tracker I used and it seemed to have all the elements needed to successfully track all your time with many features. Time tracking is not something people like to do. It is an activity that seems to make people feel like they are getting micromanaged but Harvest surprisingly made me feel otherwise. It's ease of use and the time it takes so log and track your time is something that literally takes 1 second - and then it automatically organizes it into your accounts back end for reporting. Definitely would recommend this product if your company is in the market for a good, all around, customizable and simple time tracker with all the features you could ask for. We were solving our problem of how many specific hours were being allocated to which client based on certain parameters and departments. I like the free trial feature the best. It helped determine if it was a good fit for me. I feel very organized and neat when I use this app, and it's very intuitive. I love that I can easily enter time and see any notes I added. I love the compatibility between having it open on my laptop and phone at the same time and can use both simultaneously. Overall, it's extremely functional and I can bill clients easily. There are other free apps you can use that compete with this project. I have used Toggl before and it is a free time tracking software. I'm not a fan of the price since I am a freelancer and work for and with myself only. So my only complaint is that I wish it was free, but I understand why it isn't; because it's so easy to use and worth your money. Good option if you're willing to pay for a time tracking software. Tracking time to know how much to charge my clients. The reports are clear and simple and my clients can review what the tasks were. I think this software would be even more awesome if I was working with a team on my projects because of all the team features this software provides; great option for team management software as well as time tracking. It is so easy to use and understand. I like the idea of a play button instead of more traditional stopwatch-esque iconography. The app is well designed. And I absolutely love how simple it is. We always get quick and courteous support from harvest when we have any issues. I absolutely love the reminders and how you can stop/start a timer from anywhere. I'm constantly creating a timer and leaving it on all night. The app on my phone reminds me when it's gone too long and I can fix it from my phone even if I stared it from my computer. Not much else to say. It does what I need it to and does it well! It has one or two bugs in the Mac app that are kind of annoying. When it starts up, it immediately opens the pop-up window and won't go away for at least a minute, but that might be my machine more than the app. I don't like how it takes over some keyboard shortcuts without asking. I use 2 of them frequently in other apps, but I ended up activating a Harvest command instead of action in the app I was using, which interrupted my workflow. It's easy to turn off, but they should prompt the user about this especially since the are hidden in the preferences menu. I wish one could decide whether the timer displays in decimals or in minutes, or at least have a quick way to view the decimal time in minutes (maybe like hovering over the timecode in the mac menu bar?). I prefer the decimal display most of the time, but there are times where I need the know the minutes and have to do the ratio, which is kind of annoying. Timekeeping for multiple projects (and types of projects) amongst multiple clients in various US states. I enjoy using Harvest for multiple reasons. It is very user friendly and easy to understand, it tracks my time accurately and also provides me with a motivational quote every morning when I open it. There is nothing that I dislike, the program syncs seamlessly with my internet browser, the app on my phone and also the app on my computer. Harvest is extremely user friendly and simple to use. Our company has benefited from having this program. Time tracking has become much easier and much more streamlined with Harvest. We can now see where our team's time is spent and which accounts we make the most profit on. "Great Invoicing and Timekeeping System "
Harvey allows Macleod & Co. to easily create professional invoices that we can quickly sent off to our clients. It gives us the freedom to create our invoices from our categorized projects or by a free form invoice. The reports for the team are very helpful as well. In my past experience, Quickbooks Online and Harvest have not always communicated the best. Ultimately, I ended up removing the Harvest and Quickbooks Online component to prevent issues happening in the future. If you would like an easy to use time keeping and invoicing system I would recommend moving forward with Harvest. With Harvest, we are able to simplify our Invoicing system. I am able to easily see if there are invoices that have not yet been paid, or those that are about to be due. I can save PDFs and send out the invoices straight from Harvest. I also have the option to allow the clients to pay with a card through Paypal on Harvest. "My alltime favorite SaaS tool"
Harvest is everything its marketed as for time-tracking, project tracking, and Invoicing, ... and way more. TimeTracking: My least favorite task in the world has been transformed by their easy clean interface that runs on all devices. I can start timer on my desktop, walk away, get in the car, and pick up the time on my phone. The timer registers time to Client & Project, with notes that can appear (or be edited) in your invoice. (Oh and you can track project expenses & Mileage too, with images of receipts). Invoicing: at the end of your billing period, at click of a button you can pull all the time and expenses for a client and as many of their projects as you want billed together. You can invoice a total, or with detailed line items. 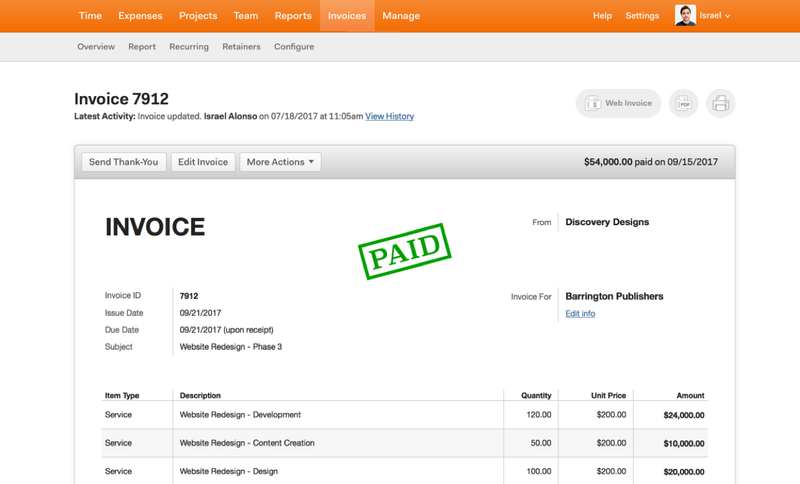 The invoice editor is really clean, items can be added, removed, edited re-ordered with ease. When you send the invoice, you can pick which of the clients' people get the email, and they get a customizable summary email with a PDF attachment, and you can include A PAYMENT LINK! for webpay. Invoices bill time at a task rate or a project rate, which you set up when you set up a client project. Clients and Projects: list the people and projects for each client. Free version allows limited projects, so for 1st few months I bundled some projects under a client called "Misc" which worked fine. (but Harvest was so useful I soon moved to paid). Projects are my favorite feature. Each project can have tasks with a budget of time or money (all tasks with same value, or set different costs on different tasks). As time is tracked on the timer, the time used/remaining shows graphically per task and for the whole project. This has been INVALUABLE in presenting project status to clients, as well as having instant visual on which tasks are over/under budget - so potential project over-runs can be spotted in real-time without use of spreadsheets, downloads, caluclator... and adjustments made before the project goes over budget. I LOVE THIS FEATURE!!! Estimates: Estimates are easy to put together. I include my ToS in the notes at the bottom. The can be line items (like the invoice) or a single line summary. When you send an estimate THE CLIENT CAN ACCEPT/DECLINE with a button on the estimate. So I treat that as a signature of accepting estimate and ToS. I also use Harvest to do all my ScheduleC business expense tracking. I have my business as a Client, with a project for each year eg: "Taxes 2016". I enter all my all my ScheduleC tax deductible expenses/mileage under that project, and add receipts as photos or PDFs. At tax time, I just run a report of project expenses and for mileage, and Voila, Schedule C done and documented! On projects involving another consultant, I pay to add a user and have them track their time in Harvest too, so their hours are included in my project analysis and billing, with not data entry on my part. AND I use Harvest to track all my volunteer hours, mileage and reimbursable expenses... and any other nonbillable projects that need tracking. At present Invoicing and estimates are not available on the phone app, but that's not much of a limitation. Time & Expenses are, and that's mainly what I need on the go. You can't save favorite time/billing reports, but reports are SO simple to run this has not been an issue for me. Absolutely best of breed for tracking clients & projects; costs, time, budget to actuals. For doing Estimates, getting online payment, sending clients scheduled Payment reminders... alround fantastic. Managing my consulting business, time, projects, estimates, expenses, mileage & billing... and tax expense tracking. 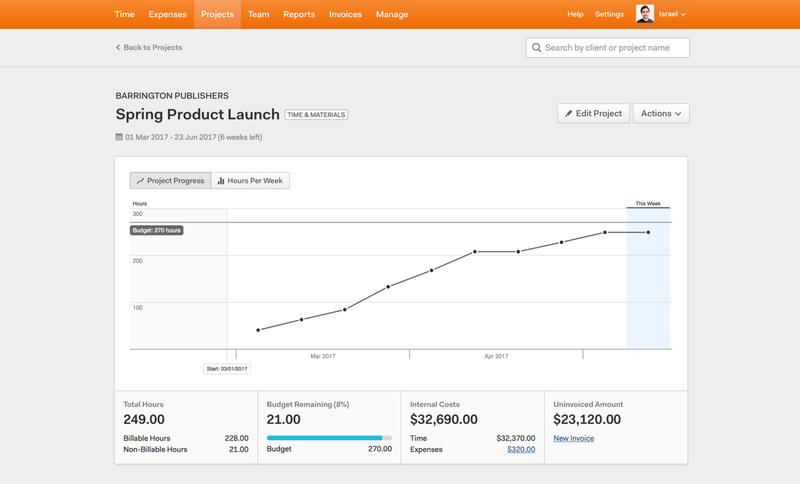 "Great Time Tracking/Project Budget Tracking Software"
The program is easy to use. It's very customizable. The customer service reps are quick to respond and very helpful. The software allows you to track project budget in multiple ways. You can produce quick and easy reports that are also customizable. You can prepare invoices. It's a great tool to track budgets for a number of different projects. It's quick to learn, easy to use and a great software. It's increased our teams efficicency tremendously. No more excel spreadsheets for us. Our staff gave the product great reviews. I would highly recommend this product. The product is quite expensive. I work for a non-profit which is a small company. The fees are quite high and there is no reduced fee for small businesses. It would also be great if Harvest allowed you to track the budget based on the client. The way it currently works is to track the budget based on the project. Great time tracking, budget monitoring program. Try it! This allows us to keep on top of our budget. To quickly and accurately make reports at any point during a project. We can easily see who has overspent and on what tasks. It helps us track staff efficiency and overall, it keeps us very aware and up to date on our finances. I like how you can integrate harvest into other programs (like Basecamp & Google Chrome for example) so you can easily click the stopwatch and log what you're working on in real time. I also think it's great that we're able to pull reports by project and by which team worked on the project. This helps us a lot because then we can see if we're spreading ourselves too thin, spending too much time on one client, or not enough time on another. If we didn't have this feature, it would be really easy to undermanage or overmanage our clients. We're also a very fair company, so Harvest allows us to make sure everyone is getting the same amount of attention. I don't care much for the reporting. I don't think it is as advanced as it could be. It would be nice if there was a way we can see if we've gotten more efficient at a certain task. Log as accurately as you can. You will appreciate it later. As a business we're able to see how much time as a whole company we spend on one client. We can then see if this client is worth our time in terms of how much money we're making and how many hours / week we're spending. We're now able to answer whether or not this client is profitable or if they are just time consuming. "Delighted with the product and the support!" The ease with which we can complete and send estimates, the speed of sending invoices once estimates are approved and managing time for all our projects is absolutely first rate! If I had a wish list. I wish I could have a regular invoice converted into a retainer invoice. We sometimes get these two confused. I would also like to be able to turn an accepted estimate into a project, just like being able to convert an estimate into an invoice. One final item. I would love it if the mobile app contained all the standard features for a project manager or salesperson: the ability for the mobile app to create an estimate and the ability to create/manage projects. Get started with one user...it's free! Try your first estimate, pretend it is accepted, create an invoice, then create a project, track time, close project, boom! So easy to set up and use. Estimate creation; invoicing & collections; project and time management. I love the fact that I have an app on my phone that can keep the same timer running as my desktop so that I can easily track time that is away from my computer as well! I dislike the fact that I can't create new time entries for previous days without having to go to the harvest website. I wish we could this from the program itself. I think this program is excellent for timekeeping. As a creative I do have to rely on someone from account service to add me to projects so that I can track my time, but this is rarely an issue. I love that there is an app so I can track time from my phone. Also I am not responsible for client invoicing, but I hear that Harvest does make that a lot easier! Keeping timesheets for projects is a lot easier with an easily accessible timing app like Harvest. "Harvest is thorough and useful"
Although I don't know much about time tracking software, Harvest seems to be the best one available. It pretty much gives you the ability two describe in great detail and in great specifics the kind of project that you are doing and the work you're doing on each project. I also very much enjoy the fact that there is a very easy to use mobile app for Harvest, because it allows me to track my time even when the Internet isn't working, and I can also voice dictate my tasks a lot quicker than typing on the desktop. It has a day View and a week view, but I'd honestly like to see a month view. It would make jumping back in time to see what I did on each project a little bit quicker. I really hate, on the mobile app, that I do not have access to the full keyboard when entering in a Time. I often have to start the timer, let it run for about a minute, stop the timer, and then manually enter the time I spent on a thing, carefully avoiding backspacing the colon. Get in the habit of describing in great detail what you're doing for each project immediately after completing that task. I have, as an employee, falling into the very bad habit of waiting a full two weeks before going back and filling in the details for each task, which takes me about 30 to 45 minutes. Our team uses Harvest to track all of the time spent on every project in a broad sense. We separate each task and each project because we also use Harvest to send invoices to a clients so that they can see what exactly went into all the time spent on their projects. Harvest has also helped me a lot to more accurately gauge how long the task will take me before I do it. "Easy to use, for small biz"
I work for a small agency, and Harvest is great for having an easy and simple way of tracking time within projects. They're aren't a bunch of unnecessary tools and widgets and the UI design is very pleasing. Plus you can click into projects and see hours and budgets at a high scale, depending on your user permissions. It also remembers what projects and activities you've used in the past, so you don't have to insert the same information over and over again. For my team, we've come to find that digging really deep into a project or building out robust timelines, gantt charts, and project plans isn't a capability in Harvest. While we love using it, it may not be able to scale with our growing team. This tool is definitely best for companies with I'd say less than 10 people or non-complex, long-term projects. Be sure you're a small team and don't expect Harvest to solve all of your problems. Great for small, growing teams who need to get organized. Basic and simple time management and budget tracking. It's helped us keep a simple and clear view of what's going on, but it's not the most robust tool. It's easy for any of us to learn and all levels of the org. to see how their hours are affecting the project as a whole. Es una herramienta sencilla, se pueden aprender todas sus funciones de forma rápida. Aunque no todo el mundo pueda darle la importancia que merece esta herramienta para registrar nuestros tiempo de actividad es sumamente poderosa y útil. En ocasiones nos olvidamos que tenemos el tiempo corriendo, incluir la posibilidad de tener recordatorios en ventanas emergentes dentro del navegador cada cierto tiempo seria un plus bastante interesante o la función de programar cuanto tiempo deseo destinar a cada actividad. La rutina es lo mas importante para sacar provecho a esta herramienta, ya que de nada servirá si no se reporta tiempo en ella o los reportes son inexactos, así que crear una buena costumbre de reportes y que estos sean lo mas específicos posible es la clave para sacar el máximo provecho. Monitoreamos el tiempo que se invierte en cada labor de soporte por cada cliente de esta forma se puede ver en que áreas o a que clientes en particular se les dedica mas o menos tiempo del necesario dando la posibilidad de realizar un calculo de los recursos destinados a cada área. "Easy to use and many functions"
It's reasonably-priced and very easy to use. We have lots of contractors and they use our account as well as our employees. We have one small company that has no employees and I have to keep paying for the account even when we don't currently have any subcontractors using it. We rarely have any issues with Harvest, and when the website does have a rare problem, they notify me and let me know what's going on and then when it is back up again. It's extremely easy for everyone to use and flexible that you can add/remove users at any time so you are not paying for people who aren't currently working (like contractors or people who work only during the summer). We love it! We used to use Google Sheets for time tracking, and this is much easier and more functional. I can get reports by jobs, people, and/or tasks so that we can bill clients easily. No more issues with disputes about time and I can see everyone's time right away. Rates can be added as well as project managers. "Best Time Tracker/Invoice Creation Combo"
Lots of apps track time, and lots of apps generate invoices. Few can do both easily, and also integrate seamlessly with your project management software. It even has an iOS app for tracking on the go. Harvest is the perfect solution for my agency. It's a little expensive, and sometimes my employees accidentally overlook using the Harvest button within Asana to track tasks. I usually hate to pay for a service I can get for free somewhere else, but Harvest has been worth every penny. Main recommendation: get the Chrome Extension and the phone app, and integrate it with whatever project management software you use. Info syncs seamlessly between all three applications. 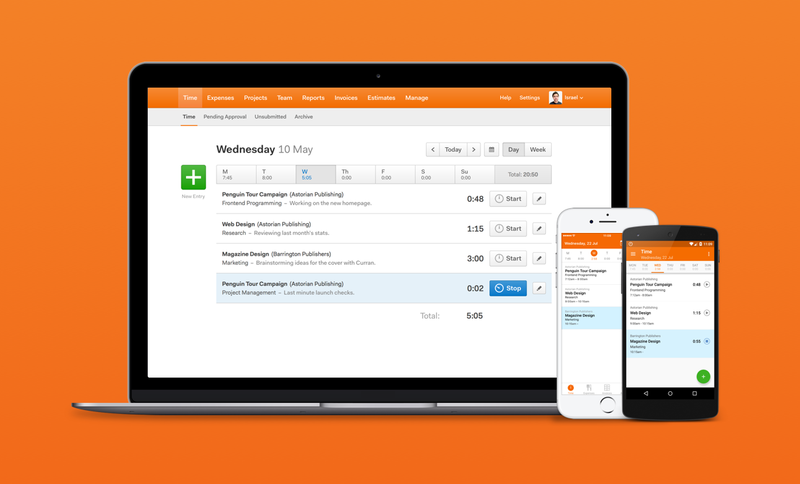 I have my employees track their time with Havest while they are working on client projects I have set up in Asana. It makes it really easy to take those tracked hours and generate monthly invoices for each client. It's easy to use. The quotes and humorous reminders you may have left a timer on or am 'tracking into the future' are quite enjoyable. I wish there was a way to set hourly or project based pricing options for the same project as some of our service tasks are project based while others are hourly. To get around this we've set them up as completely different projects and then cobble invoices together. I also don't need Harvest's entire catagory of offerings as we have other tools that do that better. Meanwhile their pricing goes up the more they offer (which makes sense). I only wish they would offer a tiered approach to allow flexibility and control to ensure all subscribers get the value/worth out of the system. Easy time tracking and record keeping. This is good for tracking time for multiple clients and multiple projects. It's easy to use, auto saves, and makes it easy to search by project, client, or date. It can get a little unwieldy to enter time as projects grow. It would be nice to have a way to cluster projects under a client, or otherwise bucket projects on the main entry screen. Very simple and easy to use. Would recommend for simple timekeeping needs. We used to use spreadsheets to track time, which was time consuming and clunky. I advocated switching to an online tool so we could make submitting our timesheets easier and faster. We looked at a few different services, and decided that Harvest was best suited to our needs. Our HR director loves it because it means less work for her to piece together information from spreadsheets, and the rest of us like being able to enter time online and not have to save and send timesheets as attachments. It all works seamlessly. Harvest is an easy to use, beautifully designed software.It is well-organized so anyone can learn and use Harvest in a very little amount of time. Team management and scheduling. Excellent integration options. The invoicing and expensing is not good enough when you are a company with more than 5 employees. On the other hand the reports per member of the team could have better filters. In easytech we provide development service and basically invoice the hours we execute each client. With harvest we not only achieve that the developers do not see the time tracking complicated but the reports that we generate are simple and clear so that our clients can review what the tasks were. "A scalable time tracking solution that makes it easy for all teams to keep track of hours"
Hows simple it is for everyone to track time. The ability to categorize your involvement and break down time even further into specific tasks or types or work. The search function can have some quirks to it and doesn't always show the result you are looking for. Do the free trial, break down projects into sub tasks and add in types of actions - you'll see very quickly how useful harvest is. Keeping track of employee hours across complex projects with limitations and restrictions. This tool has allowed me to quickly get up to speed on a project and easily organize it based on my contributions to the projects. 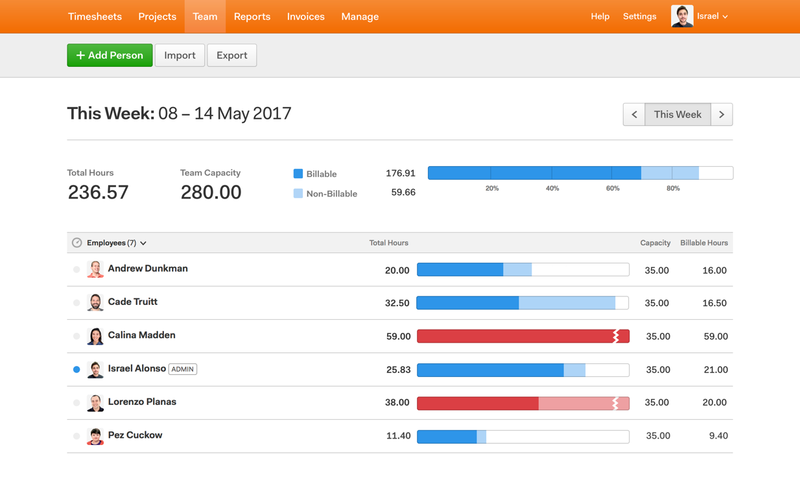 "Excellent program to create invoices and run reports"
Harvest creates custom reports for employee hours, expenses, and invoicing. Employees can easily manage their own time cards by breaking down tasks and project managers can track budgets for multiple projects. If your business has to invoice billable hours and expenses, Harvest makes the process much easier. Keeping track of billable hours and budgets. Invoicing different clients. Payroll entry and tracking. Managing expenses. "Easy to use time tracking tool"
Easy to use, track, and view time in this system. Has cute quotes every day prior to any time being entered that relate to the word "time", such as quotes from songs like Time After Time or quotes from folks like Charles Darwin. Would be nice if it integrated better with other common software and tools. Ensuring the hours that a team member worked on a client's project gets applied correctly to that client so we can invoice accurately. Much better than our old system which involved lots of spreadsheets. Harvest has this clean and sleek look to it, that really helps you quickly see what projects you're on and the time you've spent + time left to work on it. The nav bar also allows you to quickly toggle between projects, timesheets, teams, etc. Also, the handy feature of the time clock being a Chrome plugin makes the billable hour very accurate, since I can quickly start/stop the timeclock for each project. The Chrome plugin is a little wacky sometimes. I wish you could switch between projects quickly through that. It's easy when you're working on a single project at one time, but once you get multiple going, it is just messy. Harvest also has a Forecast plug-in, which have been a very positive change. This allows projects to be forecasted and arranged. I believe it pertains more to PMs who are trying to build a team for client projects, however it's great for me to see who is available for smaller tasks as well. We used to have issues with working more hours than allotted for clients, or I would get internal requests from coworkers and it's now easier for them to login and see where I am with a project, rather than hounding me until it's done. It also helps me for managing my time and projects, since I don't have a PM or manager on-location. "Harvest is a very positive experience in the work place." I enjoy how you can log your hours but also keep track of what you are doing. Its a good way to realize how much time and effort you are putting into certain tasks and projects. This eventually could determine if the time put into each is worth it, or if it should be spent on other items. So far, there is nothing I dislike about Harvest. All of my experiences have been positive. Definitely start to use it at your job if tracking your hours and progress is something you are wishing to achieve. Our team as a whole is interested in seeing where our time is spent. At the end of a month or a year our director can assess and see what we are putting our time into. This can then be compared to the results or outcomes of each project. If a project is having a lot of time spent on it, but not a positive outcome, perhaps we can focus on other things. "An Easy Way to Timetrack for A Fast-Paced Job"
Harvest embeds with Asana and on my desktop so I can timetrack specific tasks and start and stop easily. Harvest is worth the investment because it has allowed our firm to more accurately show profitability of our retainer clients. I've been using Harvest for over 2 years, and using it becomes second nature. I have been committed to accurately reflecting the hours (and minutes) of work that I spend on clients because it's very easy to do so. I'm happy to help our firm be successful! "Great tool for time tracking. " It's an easy tool to have employees use. It's just customizable enough to allow necessary tweaks to time segments without being too customizable to cause problems inside a company. It's a clean website with accurate reporting and management tools. It also links well with Asana for task management. The reporting section is accurate but can be a little messy as well. Setting up templates and adding new services to clients gets a little complex at times. Harvest is a great tool to avoid losing money on projects. I would strongly consider using Asana as well for task management. We manage around 100 clients between 40 employees. Harvest allows us to keep track of our billable hours for clients to make sure we're fulfilling without consistently going over budget on time. It helps us track non-billable time spent on meetings and training to ensure we're in the right area. It also helps us get better estimates of how much time specific tasks take across all clients. Harvest pretty much does exactly what it says it will do, and does it very well and clearly. You can track your own time and your employees' capacity, view how much time is dedicated to certain projects, and view weekly and monthly reports. There's not much to dislike about harvest, as I previously mentioned, it does pretty much exactly what it says it will do and it's very easy to figure out. Both my current and previous employers have used harvest for time tracking, and I think it is a no-brainer. It's a simple interface, has a good mobile app for logging your hours on the go, has an easy expense-submission process, and is so easy to use. I would recommend Harvest to any business that is looking for an easy and great solution for time-tracking. 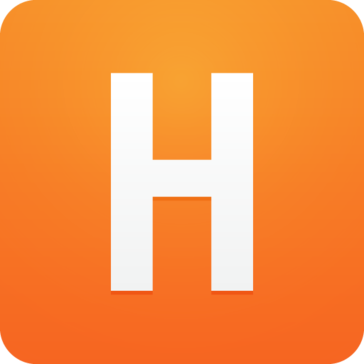 Harvest has great time tracking, easy expense submission, capacity planning, simplicity, easy of use, and a solid mobile app. All of these combine for an all around easy and great experience. "Great software. Easy to use "
Harvest is great for tracking tome and expenses. As a salesperson that is kn the road a lot all I have to do is take a picture of my receipt and enter the amount of miles driven and then I will be reimbursed next pay period. I have no real complaints. The browser plug-in isn’t the greatest thing in the world for usability but it does the job. Tracking tome and expenses. Much faster than writing everything down and filling out expense reports. "Great for tracking projects and hours commited"
Working with harvest as a account manager, I am able to track the project budget, the hours devoted to a project and able to communicate if we run the risk of going over budget. It can be cluncky to switch between projects and I have been known to forget to stop a project clock until the next morning. A reminder after an hour or so would be great to ensure for the most accurate project time. Time tracking and cost management. I have used several databases to track my work hours. Harvest allows me great flexibility based on the client. For example some projects are hourly and some are Fee-based. I like that it has a function to add PDFs of expenses, too. Very handy. I have very few issues with Harvest. The only one that comes to mind was changing categories for work billing once I was ready to Invoice. As with any software their is some leaning curve. Once you figure out where to change things, I have few issues. If you need a method for tracking client work Harvest is a cost effective and flexible platform. Their invoicing is great, too, and allows you to add PDFs of expense receipts. I need to track multiple projects for the same client and bill them each separately. It is easy with Harvest. They also allow you to have your teams access which is great when you have a project and recruit assistance. I dislike the ways it’s displayed, I rather the week start with Monday instead of the weekend, I’ve submitted sometimes on accident when I didn’t mean to and my administrator had to let me resubmit. I wish I could edit it when I submitted on accident and didn’t have to wait to get it approved to edit my mistake. "Great for small service teams!" They make invoicing and time tracking so easy. It's easy to forget to start/stop a time so you need as many barriers as possible removed. This is why I really like that they integrate with so many other options. We usually use the chrome extension because we can see the timer is on while we are working but it also integrates with Trello project management and others well. I also invoice clients directly from the program so I don't need to download the pdf and go back to my email. I love the recurring invoice setup so I don't have to remember invoices that are on an odd schedule. It's not a feature flaw of Harvest, but I would prefer if I could just use Harvest for all my needs and not need Quickbooks. Harvest suits my invoicing needs much better which is why I need them. However, I still need Quickbooks because it connects to my bank and credit card accounts which makes expense tracking a breeze. Harvest does let you add expenses but it's expenses per project not your overall business expenses. I know that Harvest syncs its invoices with Quickbooks invoices and this works OK but there can be errors if you need to make changes or undo actions. Plus, as mentioned, I have issues with the Quickbooks end but I need them for now to make my overall profit and expense reports easier. Invoicing clients and keeping track of recurring autopayments in an easy way. This saves time. Time tracking with few barriers so no excuse to forget. This keeps our work accurate. The quotes are not always great. ;-) Just kidding, I like everything! Great if you have a large team to manage. We used to use paper timesheets, but they required a computer to fill out. Each employee had to complete theirs at the end of the day, but there was only one computer to do that on, creating a traffic jam, and it used a lot of paper to print them each week. Plus people would forget how much time they put in on each project during the day. It's made billing much easier, as well as tracking labor costs and employee productivity. "Time Tracking at it's finest"
I love Harvest for it's ease of use, intuitive interface, and invoicing. There are some limitations to the invoicing that become frustrating sometimes. Most specifically, there does not seem to be a way to carry over outstanding balances from one invoice to the next. Harvest has been an almost perfect solution for my team's time tracking and client invoicing. As a small business owner who works with mid-large sized businesses, I highly recommend this service for ease of use and professionalism. My entire team uses harvest for time tracking, which allows us to ensure that we're spending the appropriate amount of time on each project and allows me to see that my employees are spending the appropriate amount of time working. We know exactly how much we should be billing out clients, and it's easy to see if we are exceeding the scope of work in time spent. Harvest also makes invoicing exceptionally easy. I was on the end-user side of the software which was managed by my Supervisor/Manager. So far it has served both me and the manager well for time-tracking and project tracking needs. Some of the reporting methods might not be that accurate. The created of the harvest task has to do the due diligence in understanding the short-coming of the tool and make work-around for it. Eg: Office meeting time is actually a task which is to be made to show that you were productive but for a different cause. Great tool for small to medium size companies. For large data sets, harvest needs to provide more advance tools to reduce repetitive editing of tasks. Better than Excel sheets. Project timeline and tracking, budgeting estimations, project assignments. "Does what I want! Invoice, tracks time, reporting!" I don't like the idea of having to pay PER user, but that's only because I don't like spending money. For what I pay as an individual user, it's totally worth it. But starting off as freelancer and I'd like my designer who I rarely use, I'd like him to track time as well, and I go back and forth on if it's worth it to get him an account. I feel it's the best way to keep track of invoices, expenses, & time. Invoicing clients, automatic reminders to clients who haven't paid their invoice, tracking time, seeing how much I'm making each month. When I was using this as a team at another company, it was amazing to see how how much time my co-workers spent on certain projects. Knowing how much time is being spent on a project helps me better determine how I should adjust my fees in the future. I like that I can upload receipts for my expenses straight from my phone. "Accurate way to track time"
Harvest helps track time accurately, and it's definitely a step up from manual invoicing or keeping a tracking spreadsheet. The interface is a bit primitive, and it feels like permissions are needed to an unnecessary level. The platform would be a bit more useful if it placed more trust in users without high-level persmissions and allowed them enter time at their discretion. Harvest is pretty popular these days, so a lot of people are already familiar with it, but make sure to take into account the training time to get new team members used to using it. Harvest replaced a very primitive time-tracking solution that involved Google docs spreadsheets. This approach is definitely more professional and scaleable.